Even a couple of years ago if you’d asked me about Feng Shui I would have told you I thought it was superstitious *ahem* nonsense! So fast forward to now, how on earth have I come to be taking a professional qualification in it?! That’s not to say Feng Shui hadn’t been starting to crop up on my radar – over the last year or so it had popped up into my consciousness in a few places – a mention in a book here, some I met there, one of my interior design course students being a practitioner. Gradually, I started to take notice. But still it’s quite a leap to go from thinking I should maybe buy myself a book or something…. to taking a qualification in it! So how’d that happen? The short answer is ….. I inadvertently Feng Shui’d myself! Last summer, without any knowledge of Feng Shui, I made a few tweaks in my own home as we had a photographer coming to shoot it for my site. It wasn’t until I started the course (on what I thought was a whim!) and started analysing my home for my homework that I realised how one of those changes had manifested itself into me studying Feng Shui! What!? How does that work? 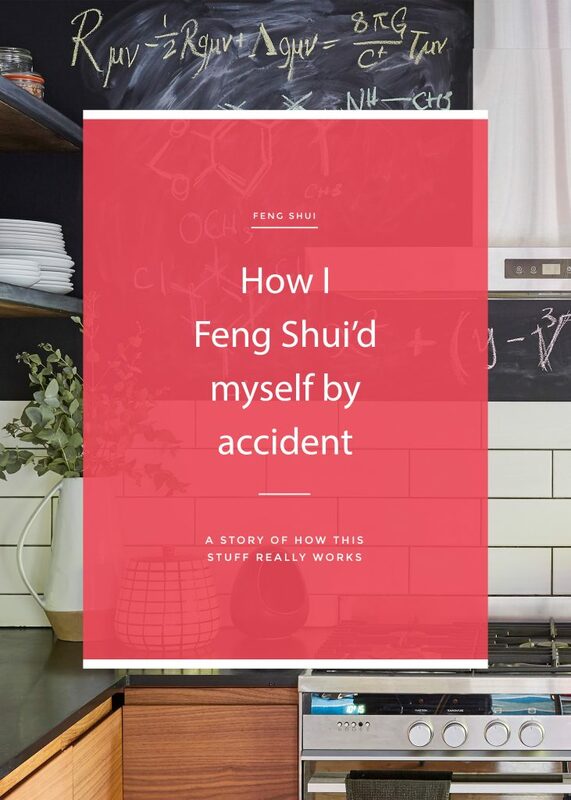 So any of you who is at all familiar with Feng Shui might know about the Ba Gua – this is effectively a map for how different areas of your home relate to different areas of your life and can be used to help manifest your desires in said areas. There are areas for: your journey through life, self-development/peace of mind, our ‘elders’ (including parents, bosses, in-laws etc), our wealth and well-being, fame and recognition, our relationships, our children including (our creative endeavours), and ‘helpful people’ which also includes travel and coincidences. So what did I do that manifested itself into me studying Feng Shui?! 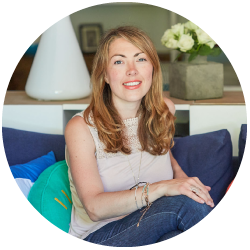 Well, as I later found out when I started doing my homework, our kitchen happens to be in our ‘inner journey’ sector – the area to put something that represents something you want to learn about in order to manifest that into your life. In the kitchen we have a blackboard wall – to put our grocery lists and so on. The night before the photographer came hubbie and I were debating what to put up there for the photos. We didn’t want everyone to see our shopping list, to have some pretentious inspirational life quote and since neither hubby nor I is particularly good at drawing an artwork that was out…. but we couldn’t work out what to do instead! So I set about Googling. And the first thing I put up there was part of Einstein’s theory of relativity. What does this have to do with Feng Shui? Well one Wed in mid Sept – I read a blog post saying that in astrological terms it was a really good time to start learning about something you were interested in (sorry whomever’s blog post that was I looked for it but couldn’t find it after the even otherwise I’d credit you!). Almost immediately, totally out of know where, the idea popped into my head that I wanted to find out more about Feng Shui. Then it dawned on me that September was the time of year that courses typically start here in the UK… So procrastinating about doing some work I was supposed to do, instead I found myself searching Feng Shui courses. I found a weekend taster course happening near me that coming weekend, managed to convince my hubbie to take care of the little one for the weekend, and snagged myself a last minute slot on the course… all within the space of a few hours! Three days later I found myself sitting in class listening to my tutor explaining to us how at a fundamental level the whole basis of Qi (energy), which is central to Feng Shui, is all about the electro-magnetic waves of energy that come to earth from the sun and other planets in our solar system and how all matter has (or really IS) energy – which is our course one of Einstein’s famous discoveries! Suddenly this “superstitious woo-woo nonsense” made absolute sense. It isn’t superstition at all – sure it kinda sounds like it is, because when this stuff was being encoded several thousand years BC they didn’t have the scientific evidence or language to back any of this up. So they used things with which they were familiar – symbols, animals and stories to describe their discoveries, but actually now the fundamentals of it are backed up by science! But it isn’t some airy-fairy concept – it’s simply understanding and then balancing the energy of your home to be in harmony with it’s inhabitants – for improved heath, happiness and prosperity. Then when I started applying the Ba Gua to our home and analysing it and realised that I had put some of Einstein’s equations in the area to put something I wanted to learn more about my mind was blown again! Suddenly it was clear to me that I had unwittingly Feng Shui’d myself into studying Feng Shui – and, by golly, this stuff works…EVEN IF YOU AREN’T AWARE OF IT! Feng Shui works even when you aren’t aware of it. My teacher explained it really well – because Feng Shui, isn’t actually about putting superstitious symbols in (I’m studying classical Feng Shui, not the simplified, modernized, black hat version), it’s essentially balancing the electro-magnetic frequencies that are inherent our home itself and possessions. So Feng Shui isn’t actually something you “do” – Feng Shui exists everywhere already. The choice therefore is whether to engage with it and actively manage, enhance and, where necessary, cure it… or whether you let yourself simply be at the mercy of it! Well I have an exciting offer for 6 of you lucky readers! I need to complete 6 case studies as part of my qualification. So I am looking for 6 volunteers who will get a full Feng Shui consultation (min. value £500) and accompanying report (value £250). What do I mean by a token energetic exchange? If baking is your thing you could bake me a cake (gluten-free please!) or you could give me a copy of your ebook, a plant or say a gift voucher – whatever suits. Ideally these consultations would be conducted in person in your home, so priority will be given to anyone living locally to me in North/East/CentralLondon; however, if I don’t have enough local volunteers then I will open this up to anyone further afield via Skype. What info will you need to be able to provide? You will need to provide me with a SCALE floorplan of the ground floor of your home (if you live in a house), or the main floor of your apartment. If it’s an in-person consultation then I will take a compass reading on site, otherwise for Skype I will send you instructions as to how to take a compass reading yourself (please note the results will be dependent on the accuracy of your reading). For skype consultations, I will also need some photographs of your home in advance and you will need to use a mobile/portable device for the skype call so that we can take a walk around your home on the call. I’ll let the lucky applicants know by Tues 23rd May (before I go of on my hols to NYC – woohoo!) that you have been selected. So what you waiting for? What exciting things could Feng Shui help you manifest into your life? !